The 2016 AHS Special Lecture Series will be held at UNIST Library on April 11st, 2016. 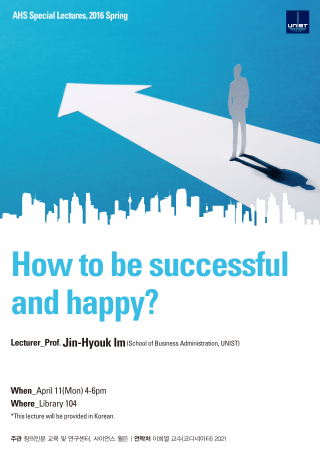 The lecture, entitled “How to be Successful and Happy?” will be presented by Prof. Jin-Hyouk Im (School of Business Administration, UNIST), the Director of Center for Teaching and Learning from 16:00 to 18:00 p.m. This lecture will be presented only in Korean.